The Google Certified Publishing Partner (GCPP) program was started by Google to assist the publishers with direct access to Google. Google Certified Publishing Partners represents companies that have been certified and recognised by Google after a rigorous process, to assist publishers with an array of Google products such as Google Adsense, Google Double Click for Publishers (DFP) and Google Ad Exchange. Whether you are new on Adsense and need help to startup or you are looking at optimizing your overall revenues through better setup and management of DFP or you are looking to scale up via newer source of revenue, we are here to assist you in achieving your targets. If you are new to Adsense or need help in Starting up, understanding the jargon, making sense of the reports, continuous improvement. If you are already monetising with Google but need help in improving your revenues, a GCPP can help. To scale up to new products, new integrations and newer sources of revenue, a GCPP can assist in achieving your targets. 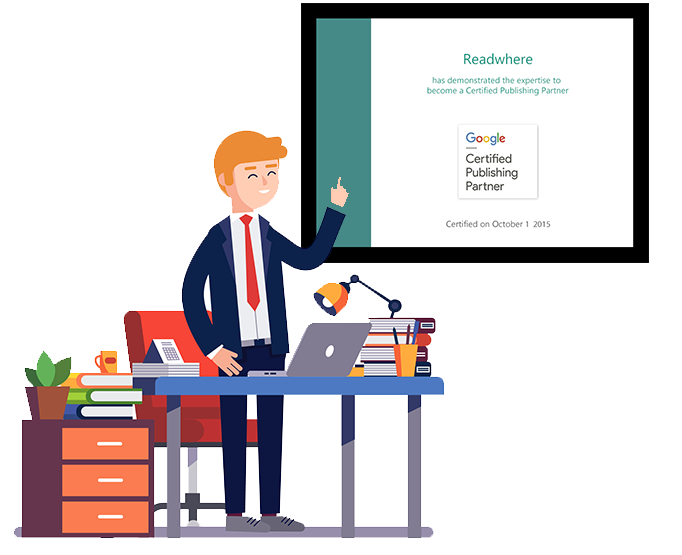 The GCPP badge and certificate is an indicator of the rigour each partner is put through before Google considers them good enough to work with the publishers on their coveted platform. Each person working on an account are certified professionals on Google products (Adsense/ Adx/ DFP). With years of expertise in providing solutions in the field of mobile tech, Ad tech, digital services to host of clients globally, Readwhere is a proud owner of GCPP badge. WHY TO CHOOSE A GOOGLE CERTIFIED PUBLISHING PARTNER ? As the adage goes “Focus on your strengths, delegate your weakness”, as a Google Certified Publishing Partner, our core competency lies in helping the publishers to create, organise, optimise and manage their complete Ad account and assist in enhancing Ad revenues. The Publishers can invest their time and energies in creation and publishing of content and let us take care of their Ad and Revenue management. WHY READWHERE AD EXCHANGE AS A GCPP? Being a technology driven company, we at Readwhere, continuously strive hard to keep ourselves abreast with the latest technological changes happening in the Ad tech landscape. This not only helps us to stay ahead of the curve but also helps us to provide our publishers with the best in class services related to Advertising technology. Keeping abreast with the latest technological changes related to Google’s suite of products and services also helps us to renew and further strengthen our position as a GCPP company. We work closely with our Google counterparts and thus have access to latest updates related to the products, policy changes, new launches etc. which further gives us the edge in terms of early mover advantage and which we pass on to our clients. Thus, we are one stop solution for all Mobile/Ad tech related requirements for our publishers. Today Readwhere is one of the leading GCPP company in India working with some of the largest publisher accounts, PAN India. We are also gradually in the process of increasing our footprint globally. We are proud to be the only Vernacular exchange GCPP company in India and helping our publishers in the vernacular space to leverage their brand strength in more productive manner. We command a fleet of seasoned experts known for their client service, support and technical knowhow, which has helped our clients in achieving higher revenues year on year. Are you up the challenge and want your Ad earnings to grow? Let’s connect and discuss how our solutions can create substantial results for your account.